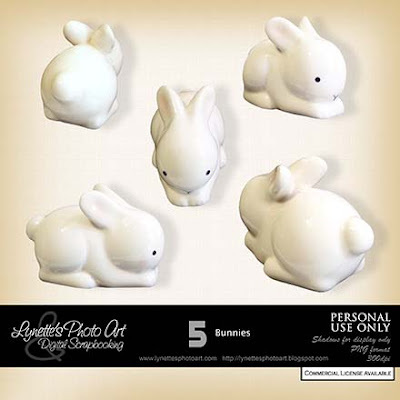 These bunnies are so sweet in their simplicity! They bring to mind how complicated and busy we have made our lives today and the price we are paying for it in our health and our families. This is not the abundant life God designed us to live. Why not take a little of that precious time today to really look at where you spend your time. I know everyone thinks everything is absolutely necessary, but that is not true. Satan knows that if he can deceive us into thinking so much is essential, then we will be so busy that not only our health and families will suffer, but he will succeed in keeping us from God. Just too busy. It is truth that we find a way to do what is most important to us. Think on that one a bit, and what it reveals about us. This is a challenge I lay before you. Turn off the TV, the music, everything and give your entire attention only to seeking God's truth. Pray for the Holy Spirit to reveal the truth to you about your life. What is truly essential for life? There is so much that can be eliminated and the lasting rewards of spending that time differently are awesome! Do you buy the lie that your children must be involved in all kinds of extra circular activities every day of the week to grow up well and to have good lives? The truth is that they too are over burdened with lack of time and overly complex lives. They are not allowed to be children. As in all things, God teaches us balance. Let them choose a worthy activity and support them in it. Then let them be children the rest of the time. Let them learn to entertain themselves without someone else providing it for them. Encourage them to read by reading to them every night before you put them to bed from infancy on. Teach them life skills by including them in your daily chores and errands. They are going to need to know how to do them for themselves in order to have good lives and be good citizens. It can be great time together getting to really know each other and enjoy each other. This is where you build a relationship and communication that can save their lives as they face the trials and temptations of growing up. Spend time with them. Be the godly role model you are supposed to be in their lives. Don't just let them grow up like weeds and think they will be good and happy people somehow magically. Don't relegate your responsibility to train them up in the way they should go to others, not school, not a nanny, not even church, no one. It's not about what's easiest. It's about doing what's right. You are the adult. It became your responsibility the moment you participated in the creation of a new life.God holds parents accountable for the job they do raising the precious souls He entrusts to them. They aren't ours. He only let's us share them for a while and how we spend that time is serious business. Don't throw it away using the TV or video games as a baby sitter because it's easier. Your children are worth the effort, and you will be blessed in return. Thank you! Your blog post will be advertised on the DigiFree Digital Scrapbooking Freebie search engine today (look for timestamp: 06 Apr [LA 07:00pm, NY 09:00pm] - 07 Apr [UK 02:00am, OZ 12:00pm] ). Thank you for the wonderful Bunnies!! Hi Lynette, love your work! I'm wondering if you have just the wreath alone, that you used for the bunny cluster frame? I do our church's website, and it would be perfect for the new calendar page I'm working on for it...thanks!